Reaching the big milestone of a baby’s first foods can be both exciting and intimidating for parents. After all, up until this point, all a mom had to worry about (nutritionally speaking) was whether her baby was getting enough breast milk or formula. Adding solids to the mix can generate many new questions: Is the baby getting enough to eat? Is he or she getting the right nutrients? Should I buy baby food or make my own? In recent years, the latter question has received increasing attention as moms have become interested in preparing their own foods. It’s an area in which dietitians can truly help. Over the years, commercial baby foods have come a long way. Today parents have many varieties from which to choose, and they can expose their babies to a variety of fruits and vegetables. It’s important for parents who go the store-bought route to realize that they’re still able to offer their babies good nutrition, even if they’re not making the food themselves. 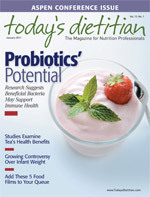 Molly Morgan, RD, CDN, owner of Creative Nutrition Solutions, agrees that store-bought baby foods can be a good option. “In fact, a bonus is that they are made in a factory setting that uses stringent sanitation practices,” she says. As for storing, Morgan recommends keeping some in labeled containers in the refrigerator and placing the remainder in ice cube trays for freezing. “Once they are frozen, you can transfer the cubes to labeled freezer bags or storage containers with the type of food and date,” she recommends. Typically one or two cubes will make a meal, depending on baby’s age and appetite. Parents also shouldn’t push solids too early. Babies should be fed breast milk or formula exclusively for the first four to six months. Most pediatricians recommend starting with a single-ingredient, iron-fortified rice cereal as the first step toward solid eating. Morgan recommends that parents opt for the store-bought baby cereals. “Even if you’re going to make your own baby food, I still suggest buying the rice or oatmeal cereals because they are properly fortified for your little one,” she says. Morgan says RDs can direct their clients to a USDA resource that outlines the specifics on food safety and properly handling homemade baby food at www.fns.usda.gov/TN/Resources/feedinginfants-ch12.pdf. In addition, Harwood suggests that parents follow the guidelines from the American Academy of Pediatrics if they have any questions about introducing solids (www.aap.org). Baby Love: Healthy, Easy, Delicious Meals for Your Baby and Toddler, a new book from Chef Geoff Tracy and his wife, chief Washington correspondent and MSNBC anchor Norah O’Donnell, has been generating a lot of buzz. In the recent release, the duo tackles homemade, healthful baby foods. That “better way” is detailed in the book, which is packed with easy, healthful recipes for babies through toddlers, along with simple techniques and sanitation tips to keep it safe. We’ve included the recipe for Cinnamon Apple Oatmeal Raisin, which is recommended for children aged 8 months and older. Consider sharing it with your clients, who just might find themselves sneaking a bite of their own for breakfast. Wash and peel the apples (peeling is optional). Cut each apple in half. Remove the seeds and stem with a melon baller. Cut each half into six pieces. Put the apple pieces, raisins, cinnamon, and water into a 4-qt pot. Turn the burner on high and cover with a lid. Cook for approximately 7 minutes, stirring once. Add the oatmeal and cook for 1 minute more, stirring throughout the final minute. Pour everything into blender. Puree until smooth. Pour into two ice cube trays and allow to cool. Wrap and freeze.